Sant Jordi in Barcelona: Books, roses...and lovers! April 23 is an especially romantic day in Catalonia. Books, roses and love fill the air. The Ramblas, Barcelona’s most famous avenue, is covered with rose petals. So where does all this romance come from? It is none other than Saint George’s Day, or Sant Jordi’s Day in the Catalan language. The festival has evolved from a mixture of traditions, the most popular being the legend of Saint George slaying a dragon, and therefore saving the King’s daughter. Thanks to his heroic feat, Saint George was named patron saint of Catalonia since the 15th century, and Sant Jordi in Barcelona became one of the greatest festivities in the city. The medieval Saint George chapel would soon host a rose fair, making George the most romantic of European saints, still inspiring sweethearts centuries later. Once upon a time, there was a dragon that lived in Catalonia, devastating its people. The dragon ravaged the gardens, devoured the cattle and terrified the villagers. It was then that the King, famous for his extraordinary justice, decided to offer the dragon a human sacrifice so that he would leave his subjects and his property in peace. The King decided to set a raffle instead of choosing among all the people who would be sacrificed. Unfortunately for him, it was his daughter, the princess. The dramatic day arrived and, when the princess walked inconsolably towards her own sacrifice, a knight on horseback appeared in the distance. The dragon, who could almost taste his gift, faced the courageous knight, who was none other than Sant Jordi. After a fight to the death, Sant Jordi threw his spear against the dragon, piercing his heart. Legend has it that from the blood of the dragon a rose bush with red roses came out. Then, Sant Jordi plucked a rose and gave it to the princess. Catalonia, and especially its capital, has taken Sant Jordi as a version of Valentine’s Day to another level – over the years the tradition developed into sweethearts exchanging gifts: men give women roses, and women give men books, from which the phrase “a rose for love and a book forever” was born. However, today, the tradition has adapted to modern times, and both a rose and a book would be a right choice to give to men or women, or children. 23rd of April is also a historical literary date, marking the death of William Shakespeare and Spain’s most famous writer, Miguel Cervantes, both having died on the same day in the year 1616. Love and literacy have exploded in Barcelona in modern times: now nearly 4 million roses are exchanged and nearly 1 million books bought on April 23rd! Like every tradition, certain rules apply, and nowadays roses of many different colors are sold. Depending on the color of the rose the meaning of the gift will be different: red roses symbolize passion between lovers; blue roses symbolize trust between friends; pink roses reflect affection, and yellow roses reflect joy. · The Palau de la Generalitat, Barcelona’s principal government building, is open to the public. So during this day you can visit the medieval palace, one of the few that still serves as the seat of government. Its interior is decorated with roses to honor Sant Jordi or Saint George. · In Las Ramblas, you will find all kinds of bookstores, book and roses stands and booths where you can find the latest editorial products. The publishers bring their most famous authors to sign copies and there is always a great stir. Do not forget to stop by here in the nest of Sant Jordi’s celebration. · The Casa Batlló celebrates this special day by covering its façade with red roses, embellishing, even more, this beautiful Catalan modernist style house. 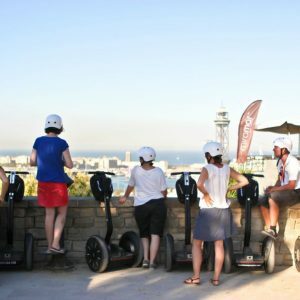 · The Columbus viewpoint makes a special offer during this day: you can ride it for free if your name is Jordi or any of its versions in another language. This goes for the Georges, Georginas and Jürgens of the whole world who only today can access the viewpoint without any cost. 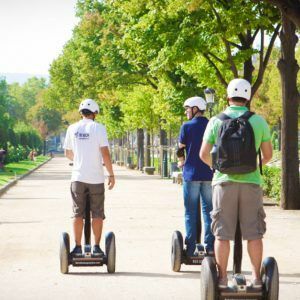 · The Sagrada Familia neighborhood festivals coincide with Sant Jordi, so you can combine a walk through the most literary party in the city with one of the best popular festivals of the city. You also can visit the Sagrada Familia during the night, since on this day the basilica extends its visiting hours. All this is just the tip of the iceberg since during this Sant Jordi in Barcelona you can enjoy concerts in the old factory of Estrella, film festivals or the Nit del Drac, a literature celebration that takes place in the Cultural Institute of the city. Street performers and musicians in public squares add to the day’s atmosphere. As you can see, there are so many options for the whole family, in addition to the lovers. And whether it’s to enjoy the books, the workshops, the exhibitions or the different official open buildings, the day of Sant Jordi is the perfect moment to visit Barcelona. Be sure to look for books stores or cafés hosting reading events on Sant Jordi’s Day in Barcelona – or even a 24-hour marathon reading of different classics of Catalan or Spanish literature! Catalonia exported its tradition of the book and the rose to the rest of the world. In 1995 UNESCO adopted 23 April as World Book Day. So, go ahead and follow in this Catalan tradition, and be sure to give your sweetheart either a rose or a book this Monday! You’ll be participating in the most romantic holidays this Sant Jordi in Barcelona!